There's this whole world of health stuff I don't really get into on my blogs. And by that I mean, there's a ton of stuff I don't know about being healthy or striving for betterment with my diet and exercise. I've touched on different products here and there when it has seemed relevant (for example, a quick mention of my prenatal vitamins) -- but otherwise keep mum on the topic. For the most part, vitamins, supplements, and herbal stuffs are a mystery to me. I have friends and family who take the entire alphabet and then some specialty stuff to boot. Others swear the entire industry is a scam and that most of the so-called "concentrated formula" is lost through sweat and urine anyway. Still others contend that maybe that stuff helps, but it's eating a well-balanced diet that is best to keep our stores full. I haven't done much to change my own routine over the years. I eat what I can in way of vitamins and minerals and take a daily multivitamin somewhat blindly. I don't know if it helps or doesn't, but since I'm in my childbearing years, I figure it can't hurt to have a hefty dose of folate in case I didn't get enough through food alone. Lately, however, I've been dipping into the related world of herbal supplements and remedies. This is where things get really murky. As I stepped foot into one of those gigantic chain vitamin suppliers earlier this week, I was overwhelmed by all the visual commotion. The lights were bright. The walls were lined with tiny glass and plastic bottles, from the most general vitamins to specialized supplements to pills for dogs + cats to take. There were energy bars and powdered drinks and all sorts of other "healthy" things all over the place. The shoppers all seemed to be coming to/from the gym, as they were donning stylish stretchy duds + their hair slicked back for activity. This trip wasn't exploratory by any means. I had gone in with a clear mission -- list in hand. a.) I've been having trouble sleeping. I've also been feeling worried. With everything going on, I know it's normal and I've been finding healthy ways to cope through running and eating well. 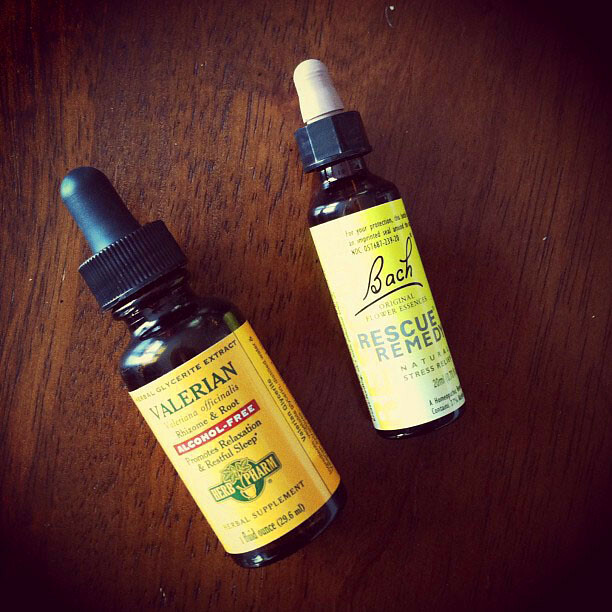 Still, I remembered a while back when I was in college, I used to take Valerian Drops to help myself sleep (a bout of insomnia + going to school in a hippie town = lots of herbal suggestions, which is how I arrived at that particular tincture). b.) I'm thinking I might need some extra calming during Ada's surgery next week -- and some of you on Twitter suggested Bach's Rescue Remedy, which contains "flower essences" made to combat a wide assortment of anxieties. According to some reviewers, just as good as dropping Xanax or Ativan. Others say a shot of whiskey would do the trick better. The guy behind the counter wasn't thrilled that I only wanted these two items and not to explore the wide world of other health-enhancing goodies he had in the store. Honestly -- the jury is still out for me. Whether it's a placebo effect or what, I know after I've taken the Valerian, I feel tired within 10 minutes and sleep much more soundly. So, that's great. The Rescue Remedy, I'm not so sure. I took it this morning to try it out but didn't feel much difference. I'll put it to the ultimate test next week and get back to you. I suppose in general, this whole trip just got me thinking about the "health" industry and all the potions and elixirs and vitamins that so many down each day. I am very much in the middle ground at this stage. I'm curious because a lot of smart, thoughtful people take these things and I wonder if I'm missing out. Yet, I'm skeptical because the whole buying experience is set up like how Bath + Body Works associates try to sell me extra lotions and soaps . . . shouldn't I be the one dictating the add-ons when it comes to stuff that might impact my health? Are vitamins and supplements or other herbals/etc. a part of your daily routine? Did you consult with a medical professional about the benefits/interactions? What types of things do you take? Have you seen noticeable health benefits?